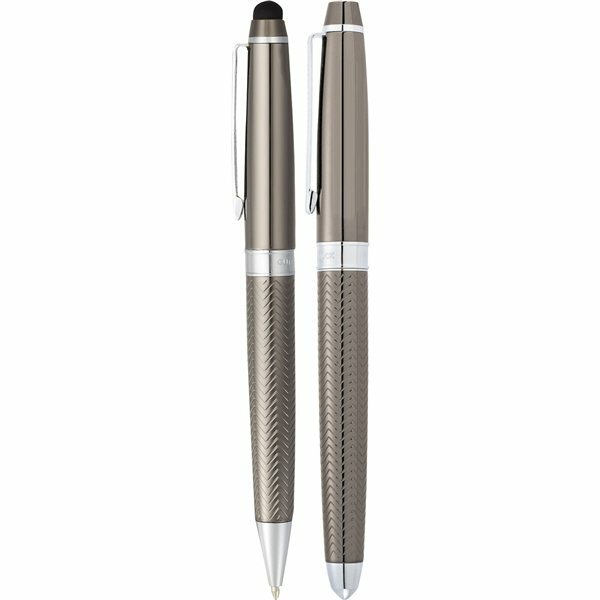 Exclusive Cutter & Buck® pen set featuring Pacific ballpoint stylus and roller ball with premium black ink cartridges. Soft rubber stylus tip is integrated into the end cap of ballpoint pen and eliminates fingerprints and smudges on your device. Compatible with any capacitive touchscreen device. Also ideal for everyday use with public touchscreens such as ATM or retail payment pads. Rosa is a delite to work with. She has always been been there when we needed her. She goes above and beyond for her customers. the overall look is what I liked most and the imprint looks great. Good advertising prodict. Great product. Will definitely order again. After I saw the finished product, I was happy, and thus was my client! the Cost is what i liked most about the product. Least nothing These were exactly what I wanted and showed up on time. Very popular giveaway! People seem to like them very much at every tradeshow we attend!